Acer has shown off its SMB and HPC entry tickets at a Milan show today. The company has been perceived as a PC and mobile-centric vendor because its offerings haven't included beefy servers or storage suited to mainstream small and medium business (SMB) or, in any way at all, the high-performance computing (HPC) market. It does have some entry-level SMB products but nothing for the mainstream. All Acer products are sold through the channel and Acer is not entering the enterprise server and storage markets because direct selling is needed. Acer president and CEO, Gianfranco Lanci, said: "We will stay indirect." Acer has a multi-brand strategy with four brands: Acer, Gateway, Packard Bell and eMachines, reflecting its acquisition history. It claims "The Acer brand name is always on the cutting edge, highly innovative and capable of simplifying life through technology and in style; while those of Gateway in America and Asia, and Packard Bell in Europe are synonymous for fashion and trendiness". Emachines "is aimed at those who adopt a strictly pragmatic approach and expect that a PC is predominantly an efficient and worthwhile instrument". On the server front Acer has been selling an Altos workgroup server line. The Altos G540 M2 is a twin Xeon 5500 system for example, while the G5450 uses 64-bit AMD Opteron processors. The company entered the home server market, using Windows Home Server software, in May this year, with the $400 Aspire easyStore AH340-UA230N using an Intel Atom 230 processor. It comes with 2GB RAM, and from 1TB to 7TB of storage. That took Acer into the very low-end server space. Gateway will now offer server and storage products focused on the mainstream SMB and HPC markets. The servers will use Intel 4-core Nehalem processors with system software by Microsoft, including Windows Server 2008 (and Hyper-V), and Windows HPC Server 2008. There are tower (GT) models, rack (GR) models, blade (GB) models, and HPC (Gemini brand) models. Gianluca Degliesposti, Acer's EMEA VP for global server business development, said the servers are ready to take 4- and 6-core Westmere processors. HPC customers will be offered blade and modular servers. There will be tape drives offered as well, but no details of these were offered. Acer sees four storage market segments: the small office and entry-level small business markets will be offered Gateway brand storage. The products are the GN100 and GN1000 and come with Windows Storage Server 2008 R2. Mainstream small and medium businesses will be offered three HDS AMS storage, positioned as SAN (Storage area network) arrays; the AMS-2000, AMS-2100, and AMS-2300, branded as Gateway Hitachi Data Systems storage. HPC customers will be offered HDS network-attached storage (NAS) products branded as the GN2000 and GN3000. These are HDS' BlueArc Mercury products. They also come with Windows DPM (Data Protection Manager). There will be modular packaging of HPC hardware, software and services in orderable units to simplify purchasing complexity. Storage to server connectivity options will include Fibre Channel, iSCSI and, for HPC, InfiniBand. Channel partners can source the intervening connectivity themselves from suppliers such as Brocade and QLogic. Acer is working with Arista and Intel on 10gigE end-points and switches, and with QLogic on its InfiniBand switches and HCAs. Degliesposti said Acer was also partnering with Panasas for HPC parallel file system storage applications. Customers needing the low latency access of flash will be offered Intel X25 solid state drives (SSDs), Hitachi AMS storage having such SSDs in their roadmap. Panasas is also looking to use these SSDs. He said both are waiting on Samsung and on Intel enlarging X25 capacity with its move to the next process geometry in the middle of 2010. The announcement event had a strong Microsoft Windows and Hyper-V focus, with a video contribution from Steve Ballmer. Asked if Acer was ignoring VMware, Degliesposti said: "We are not avoiding VMware, absolutely not. VMware is more for big enterprise. It's not left out intentionally for this. We're going to deploy that." 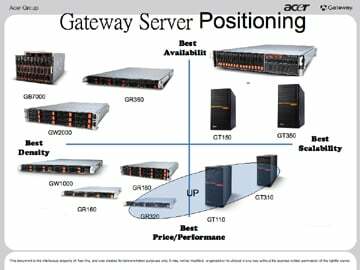 Reflecting its lack of HPC market presence Acer/Gateway will offer a series of tools, including bid management, demonstration programs, and HPC competency centres to support its channel. Acer will create dedicated HPC Competency Centres worldwide to help customers to investigate and develop HPC systems. The first competency centre will be located at the University of Pisa in early 2010. Acer will also create a global HPC Advisory Council. The existing Gateway Partner program will include the new server and storage portfolio, and allow access to Intel, Microsoft and HDS expertise. Acer has been working with HDS for some time. It launched its Acer Hitachi Storage AMS2100 as a mid-range SMB storage line in February this year, prefiguring today's announcement. The AMS product range is HDS' twin controller, modular storage array. This followed on from the Acer-Hitachi Simple Modular Storage 100 product introduced in September 2008, a low-end offering. Acer also resells the Workgroup Modular Storage 100 line. This means Acer was reselling three out of the four HDS storage lines before today, but not into the mainstream SMB market and certainly not into the HPC market. The HPC servers and storage products are available now. All the other products will be available in the first quarter of next year. Prices have not yet been decided.